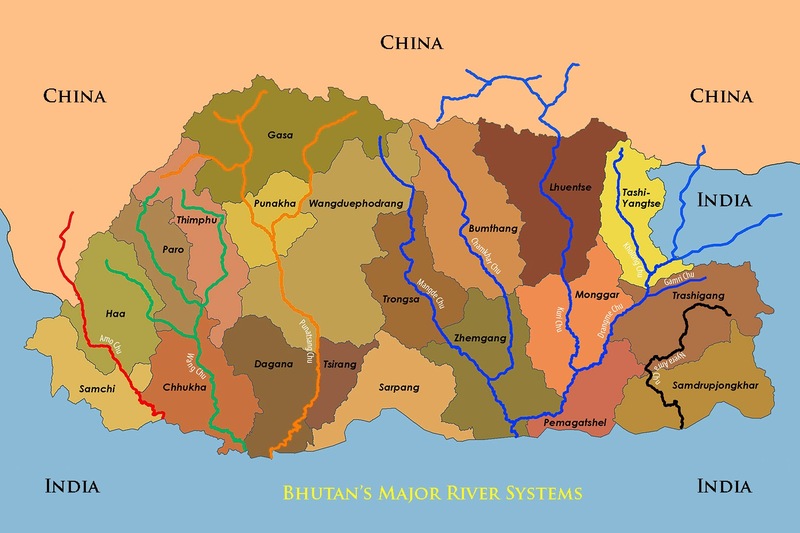 The following are the main river systems of Bhutan. The Amo Chhu originates in Tibet, China. It is also known as Toorsa. It drains into the plains of West Bengal, India. This is one of the few rivers in Bhutan that has not yet been harnessed for hydro-power. Not to say that it has not been planned. The 540MW Amochhu Hydro Power Project has been in the pipeline for many years. However, I suspect that the plan may take a while to come through, if at all, since its location is dangerously close to India’s extremely strategic Chicken Neck area. If this hadn’t been the case, a hydro-power project on this river would perhaps be among the cheapest and most profitable to do. The Wang Chhu is the collective name given to three other rivers that form the most prosperous river basin in Bhutan. Thim Chhu, Pa Chhu and Haa Chhu join together to form the great Wang Chhu. The Wang Chhu finally drains into India where it is known as Raidak. The Chukha and Tala Hydropower projects are constructed on this river system. More projects are planned in the future. The Punasang Chhu is formed by the combination of four other smaller rivers - Puna Pho Chhu, Puna Mo Chhu, Dang Chhu and Hara Chhu. All these rivers originate in Bhutan, some of which have their origins in the great peaks such as Jumolhari, Jichu Drake, Tarigung, Gungchen Singye etc. Currently Bhutan’s largest hydro-power projects - Punasangchhu Hydro Power projects I & II - are being constructed on this river system. Further downstream, there is a smaller hydropower project called the Dagachhu Hydro Power Project that is nearing completion. A tributary of the Punasangchhu called Dagachhu feeds this project. The Punasangchhu finally drains into Brahmaputra in India. Five rivers go to make the great Drangme Chhu: Chamkhar Chhu, Gamri Chhu, Kholong Chhu, Kuri Chhu and the Mange Chhu. This is the country’s largest river system and runs through Western, Central and Eastern regions of the country. A number of hydro-power projects are planned on this river system. The Kurichhu Hydro-power Project is already operational. The Mangdechhu Hydropower Project is nearing completion and construction on the Kholongchhu Hydro-power Project is about to start. One of the rivers in this system originates outside Bhutan: Kuri Chhu in Tibet, China. The Drangme Chhu finally drains into the mighty Manas in India. This river is located in the extreme East of the country and is entirely Bhutanese in origin. No hydro-power project has yet been announced on this river. Hope Nyera Ma Chhu will get one in future.